In the past few weeks I’ve been interested in the history of amplifiers and radio. The first amplifiers used only requires only a single amplification device and are known as Class A amplifiers. Class A amplifiers were popular in the early days because vacuum tubes were expensive and prone to blowing. The less of them you used, the cheaper your device would be. With the discovery of the transistor, the reliability issue was solved. However, transistors were initially expensive; so this design of amplifier style was still popular. The big down-side of the class A amplifier is that they consumes a lot of power. They even waste a lot of power while they aren’t making any sound! The base of the transistor receives a small changing current and allows a larger current to flow from collector to emitter. 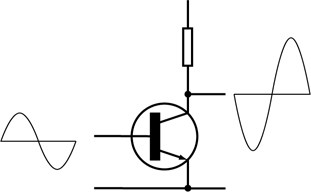 The resistor in this circuit acts as a current limiter and in addition forms a voltage-divider with the transistor acting as the second half of the divider. Most of the power is dissipated in heat in either the resistor or the transistor. The class A amplifier is only about 25% efficient — 75% of the power is given off as heat. This low efficiency is why the Class A amplifier isn’t commonly used on its own today. The core of this build is the transistor. In my spare parts bag I found a well known transistor which was first manufactured in the 1960s; the 2N3055. This would be a great transistor to use for this build as it gives the circuit a more vintage flavor. The next critical component of this circuit is the resistor. I wanted the amplifier to be a respectable volume so I’m aiming to deliver about 5 watts of power to the speaker. This means I needed a resistor that can dissipate four times this value (remember, this amplifier is only 25% efficient.) So I’ll need a resistor that can handle a whopping 20 watts of power. I certainly didn’t have a resistor that could dissipate this much power just laying around. But I did happen to have a light-bulb which I salvaged from an old laser printer. I hooked the printer bulb up to 24V and found that about 1 amp would flow through it, almost exactly what I needed. I initially hoped to create a single-transistor amplifier, however I found that the current gain was too low. 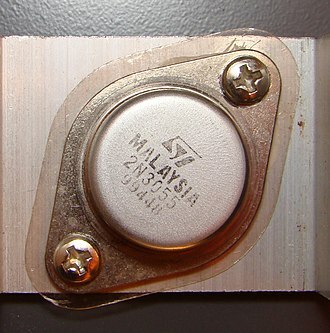 The current gain of the 2N3055 transistor is only about 20-50 times. To get my 20 watts of output I need about 1 amp of current to flow from collector to emitter. With a gain of 20,the base-emitter current transistor would therefore need to be about 1000mA / 20, or 50mA. Fifty milliamp is probably too much current to source from an audio source like a sound-card. A Darlington pair acts like a single transistor whose gain is equal to the gains of both transistors multiplied together. So if the gain of one is 20, and the other is 100, you end up with a gain of 20 * 100 = 1000. C2 and C1 are AC coupling capacitors — They allow AC to flow through them, but DC is blocked. This is desirable in this circuit because we aren’t interested in amplifying DC signals. We also don’t want current flowing to our music device, or into our speaker, when the signal isn’t changing. The light bulb here is acting as a high wattage resistor. For this circuit to work you need to find a light-bulb that draws an one or two amps at 24V. Variable resistor R1 acts as a voltage divider and it is used to adjust the bias on Q1. You should measure the voltage on the collector of Q2 then turn R1 until Q2s collector is at about ½ the supply voltage (12V in this case); this is the voltage on the output when there is no sound playing. When sound is played, the output will go above and below this value. The audio quality of this amplifier is great; especially considering the low component count, but of course it draws a lot of current. The soy oil did a great job of cooling the transistor, it only gets up to about 50C. I used the oil because I did not have a heat-sink big enough plus the cooling solution only needed to be temporary. A final thing I like about this design, in a dark-room, you can see see the faint glow of the laser printer light-bulb.